TRILOK STEEL INDUSTRIES is one of the distinguished supplier, manufacturer, exporter & stockist of Stainless Steel Oval PipeWe are also supplier & exporter of Stainless steel Oval pipe, are actually manufactured from High Quality of Standard Raw Materials and are designed as per with national and international standards.Trilok Steel Industries well known as Stainless Steel Oval Pipes manufacturers. As a largest stockholder of stainless steel Oval Pipe, we have huge inventory of Stainless Steel 304L Oval Pipe,Stainless Steel 316 Oval Pipe,Stainless steel 316L Oval Pipe and stainless Steel 201 Oval Pipe. Buy SS Oval Pipeat affordable price in India. TRILOK STEEL INDUSTRIES is supplying Stainless Steel Oval Pipe is developed by solid solution strengthening or precipitation hardening, depending on the alloy. Welding Alloy can be achieved via shielded metal-arc welding, TIG, and MIG. Generally, these Steel Oval pipeshas excellent resistance to chloride - ion stress - corrosion cracking and also provides excellent resistance to alkaline solutions.Typical applications of this SS Oval Pipesinclude the chemical, pulp and paper, aerospace, nuclear engineering and heat treating industries. In the construction industry, these Oval stainless steel pipesare used most widely. Stainless steel seamless Oval pipesalso has excellent mechanical properties and presents the desirable combination of high strength and good workability.Trilok Steel Industries is specialized as providing Stainless steel Oval Pipe in Polished Grit 120 - 600 finish.Stainless steel Oval Welded Pipe dimensions are nominated by outside diameter indicated by the NPS (imperial) or DN (metric) designator and sometimes referred to as the 'nominal bore' - and wall thickness, is determined by the schedule number. 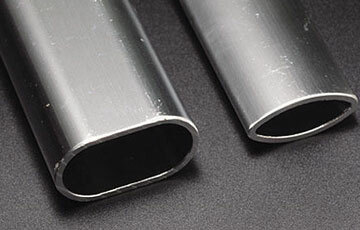 check latest updated price of stainless steel Oval Pipe. Stainless Steel Seamless Oval Pipes Stockholder, Steel EFW Oval Pipes Supplier, SS Oval Pipes, SS Oval Pipe Dealer in India, High Quality Stainless Steel Oval Pipe, Stainless Steel Oval Pipes Exporter in India, Oval Stainless Steel Pipe Exporter, Seamless Stainless Steel Oval Pipes. Stainless steel Oval Pipes are finished in accordance with customer needs regarding dimensional and wall thickness specifications as well as heat treatment for more demanding applications. In general a stainless steel Oval pipe is manufactured according to current standards API, ASTM, and ASME. If required for special projects we can also supply large diameter Oval pipes. Different wall thickness, materials and surfaces (e.g. IIIc, K240, K400, K600) as well as lengths can be produced on inquiry. Apart from that, we are identified as one of the reliable Oval Steel Pipe Exporter and Suppliers in the country. Oval pipe, Flat oval pipe and Elliptic pipe, Stainless steel oval pipe.The specialty of the oval pipe is the form itself. The wall thickness is inch-pound units is Ovaled to three decimal places in accordance with the Ovaling method of Practice E29. The wall thickness in SI units is Ovaled to one decimal place in accordance with the Ovaling method of Practice E29.